← Good bye to Ronald …?? While walking in the yard at the hostel, we looked up and noticed this beauty. Usually it would be left alone after the initial temptation to chunk a rock at it, but this time it had to be deal with swiftly and with out predigest. 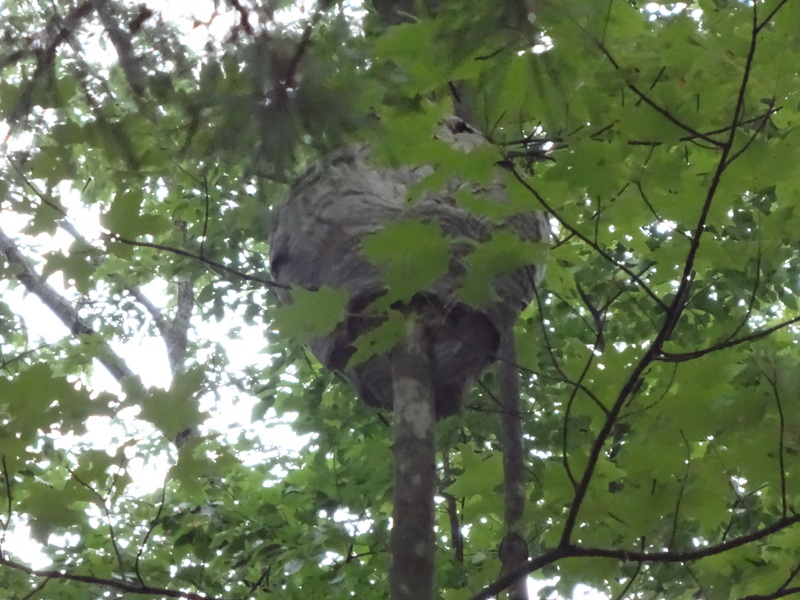 These foul tempered Bald Faced Hornets had constructed there home right over the hostel’s hiking trail and beautiful blue hammock. 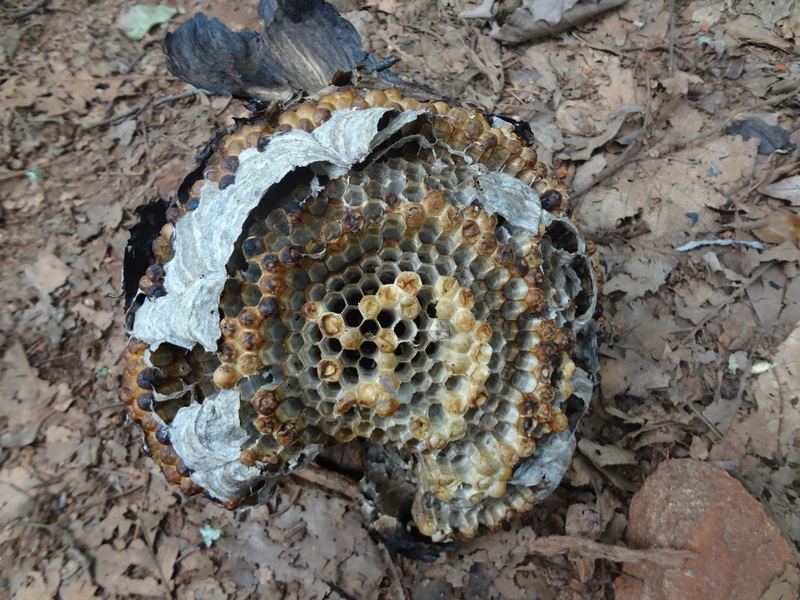 One of our guests had complained the day before about being stung by a bee and now we had found the culprits !! Our initial plan of attack was the obvious chunking of rocks and dead tree branches at the nest. We quickly learned that this was no ordinary nest, it had be crafted by the finest Bald Faced architects. Perfectly placed and able to withstand glancing blows. It was a mini version of the fabled Death Star !! After we tested the defenses with several glancing blows followed by us running full speed in the opposite direction, it became obvious that we needed a solid plan of attack. Round 1 had gone the the Bald Faced Bastards, but mind was working in Wiley Coyote mode formulating new attacks for day 2 !! At 3am I could take it no more and put Operation Flaming Sock into action. 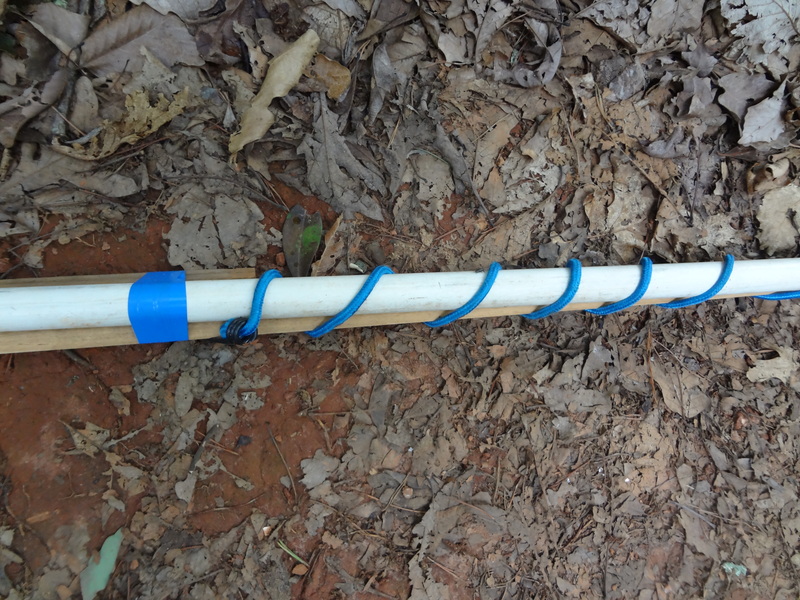 I constructed a 40 foot pole out of 2 pieces of PVC pipe and 3 pieces of house trim lashed together with 4 bungee cords and blue electrical tape. Now bear in mind this was fashioned at 3am in the dark with the voices of a thousand hornets in my head, but I had to stop the voices !! I tested my newly created weapon of mass destruction … it was much heavier than I had hoped for and flexed greatly, but it still passed the 3am test. All that was left was to tip my masterpiece with a gasoline soaked sock. 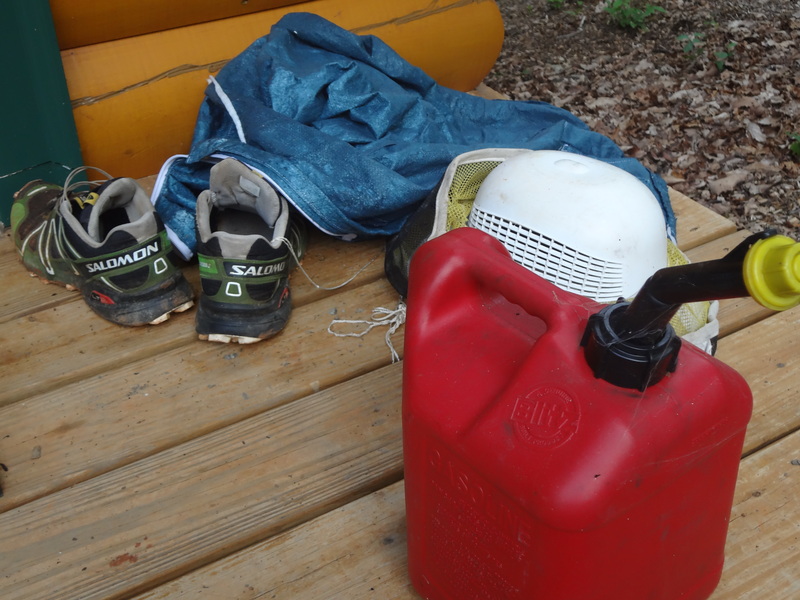 I followed a strict protocol for safety … three pairs of jeans, two sweat shirts, thick wool socks with the inner layer of pants tucked in, two pairs of gloved, a bee keepers hat and jacket, a head lamp, and a pair of Salomon running shoes for a quick get away. The next morning I awoke to find, not the total destruction that I had envisioned, but instead the rebuilding of the burned and battered nest. This was going to take some serious thought, so while I was thinking I stated chunking rock again. I learned two valuable lessons … 1) their defensive pattern was much larger now, and 2) I would never make as a baseball pitcher !! I went deep into Wiley Coyote’s playbook and came out with a brilliant catapult design that would bend the tree over, then launch the crippled nest into the stratosphere. 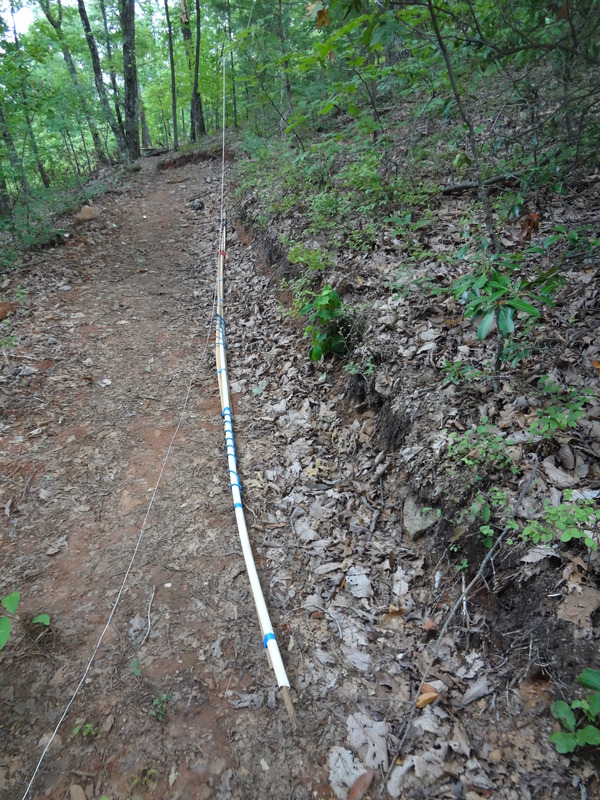 Ropes were fashioned and the Operation Launch was put into action. The first rope was flung into the tree with a rock attached with great precision. Success, stage 1 was complete, now all that was left was to attach the second rope and then bend the tree over in preparation for launch. When pulling the rope taught the rock fell off and the hornets swarmed ending all hopes for Operation Launch. I was devastated, but not beaten, I waited until dark and attacked with a can of long range RAID. It turns out that long range for RAID is about 10 feet when spraying up hill. I was dangerously close to the enemy and poorly protected, but I was desperate for a victory. To my surprise they didn’t swarm, they just sat there and bathed in the steady stream of death. 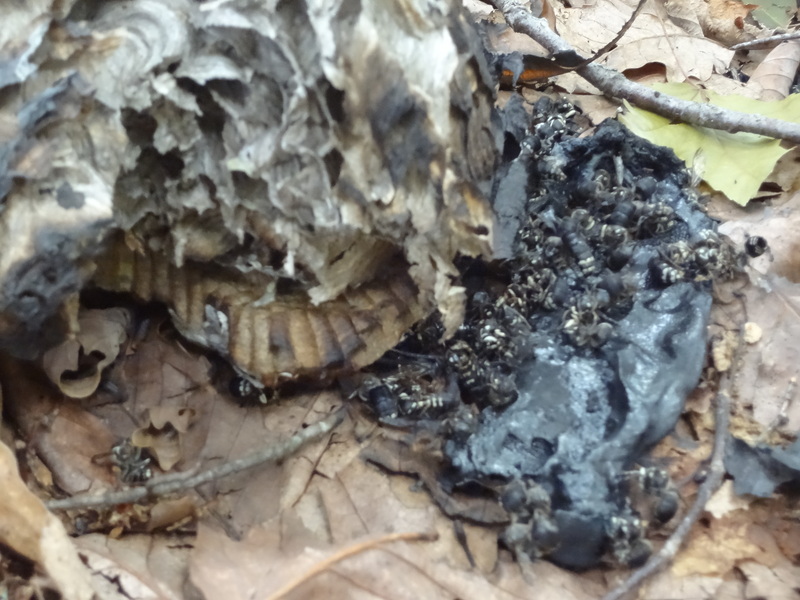 Not only did the RAID kill the hornets it caused the nest to fall to the ground. Not very a dramatic conclusion to the situation, but very effective.